Kona Coffee--A Top Coffee in the World! Who knew that a Volcano blow in 1801 would provide some of the most fertile conditions for the best coffee in the world? Grown on the misty slopes of the Hualalai volcano, the conditions are ideal for the cherry plants to produce the coffee bean. This Arabica coffee is known as the elite coffee of the world! And that's why Kona coffee is served in some of the most elite restaurants in the world. When you go to the Big Island, you can tour many of these coffee farms, drink a variety of samples and buy some fresh from the roaster. Delicious! You can tour the Kona Coffee farms year round. It is a fun side-trip to see just how Kona Coffee is made. When you go to your local Wal-mart or Hilo Hatties, you will find numerous bags of coffee for $10-20. If you look at the text it will say "Made with 100% Kona Coffee." But be savvy. If it only has 10% Kona Coffee and the other 90% is filler coffee, they can legally say made with 100% Kona Coffee. If you want quality coffee you need the bag that says 100% Pure Kona Coffee. And it typically will be more than $15/pound. What are the Best Coffee Companies? Coffee farms are every few miles along the Kona Belt Road. Finding the best depends on your taste. Here are a few online options to purchase coffee direct from Kona: . 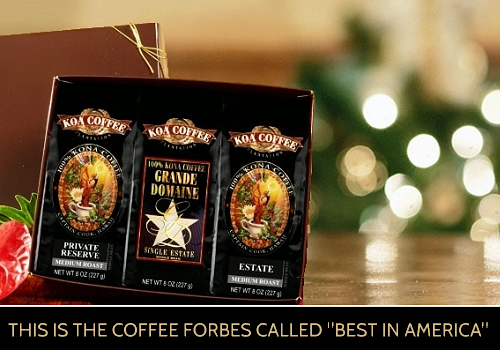 Koa Coffee: Forbes Named the Best in America! Aloha Island Coffee Hawaii Coffee Company: 100% Kona Coffee & Gourmet Coffee from Hawaii .